Carrying small pliers and screwdrivers can be helpful and comforting. When traveling without checked baggage, I feel strange leaving behind my small multitools. Being without tools is weird. 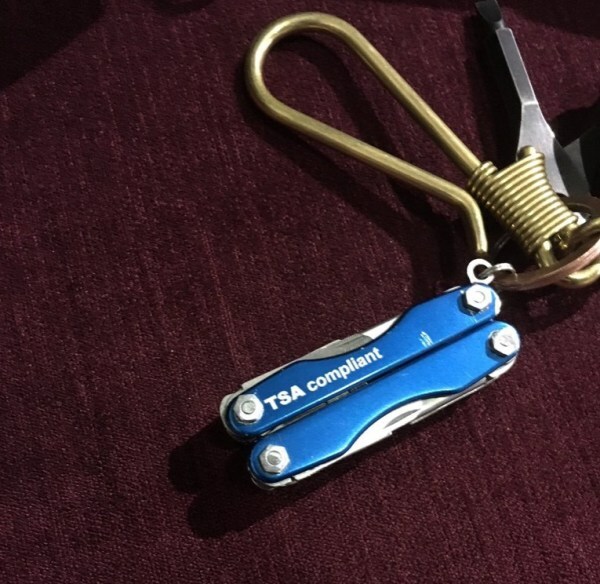 So, I decided to buy a used Leatherman Squirt on eBay for $12 (possibly a TSA auction of a previously confiscated tool), and modify it to meet/exceed the government restrictions on carry-on tools. This stipulates nothing too sharp, overly pointy, or beyond certain lengths. Here's the tool as purchased, and then going under the mill to remove the rivets. This is the anatomy of a Leatherman. My intention was to swap out the offending parts for approved ones taken from a second donor tool. I brutally snapped the file down to size, and then rounded off the corners with an abrasive disc. I went on to dull the knife blade into what looks like a mini cheese spreader, and defang the awl. This still leaves me with some pretty useful tools, particularly the pliers/wire cutters, three sizes of screwdriver blade, a stubby file and a bottle opener. Here's the finished tool. I ought to get proper knife barrel pivots instead of screws and nuts (and a dab of Loctite) to fasten it together. I recently traveled with my modded multitool through a couple of airports with no hassles. I even had one agent pull out every tool on it, shrug, and hand it back to me. I know this will be case-by-case, and at the discretion of each agent, but it sure was nice to have a multitool with me while traveling light.